To be invoiced for any of our products, simply contact us at 800-745-9970 to place an order. Once your order has been received, we will process your order, send you the posters, and invoice your company. A copy of the invoice will be sent with the poster. Payment is due upon receipt of the posters. Our website offers a secure and convenient method for our customers to place an order by Visa, MasterCard, Discover, or American Express. To place an order over the phone using your Visa, MasterCard, or American Express, please contact us at 800-745-9970 Our representatives are standing by to take your order. We also accept check by phone or you can fax your orders to 714-276-6445. 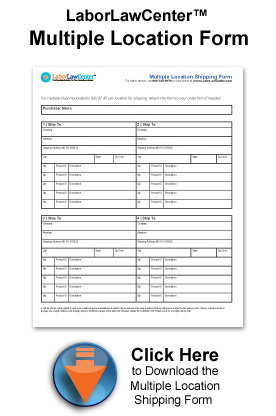 If you would like your order to be shipped to multiple locations, please fill out and send in the LaborLawCenter™ Multiple Location Shipping Form along with your order form. 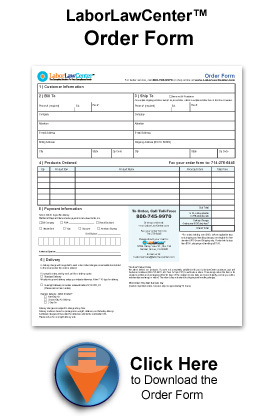 Make sure to save a copy of your order form(s) for your records.